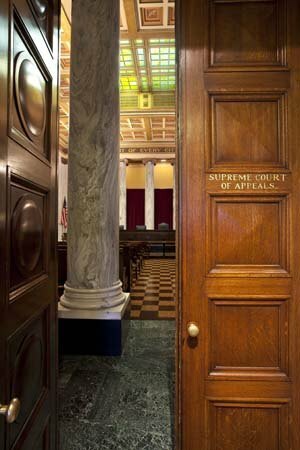 UPDATE: Steel of WV will now take their Huntington Sanitary Board rate dispute to the WV Public Service Commission , as directed, in the WV Supreme Court opinion. The West Virginia has affirmed the Cabell County Circuit Court decision that denied Steel of West Virginia relief regarding the actions by the City of Huntington, City Council and the Huntington Sanitary Board. Steel of WV had challenged the HSB fee increases for improper notice. Under the decision, the rate increase for stormwater and bond issuance were determined to be "in the course of daily business" and that the state Public Service Commission has jurisdiction to resolve the dispute. "As we have discussed, insufficiency of or noncompliance with public notice required under West Virginia Code § 24-2­-11 is within the jurisdiction of the PSC, not the circuit court. " The court ruled: "SWVA’s failure to meet the third element required for mandamus to issue, we have also discussed that “[t]he general rule is that where an administrative remedy is provided by statute or by rules and regulations having the force and effect of law, relief must be sought from the administrative body, and such remedy must be exhausted before the courts will act.” Further, we have explained that “[p]roceedings in equity for injunctions cannot be maintained where there is an administrative remedy provided by statute which is adequate and will furnish proper remedy.” Thus, the circuit court did not err in denying the writ of mandamus or in denying injunctive relief on the grounds that SWVA had another remedy at law that had not been exhausted. " The opinion is below in PDF.